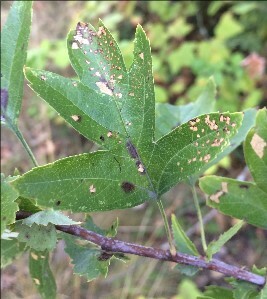 Habit: Shrub, tree, thorny. Leaf: simple, alternate, petioled, +- ovate, generally +- lobed above middle, toothed, deciduous. Inflorescence: panicle on short-shoot tips, domed; pedicel bractlets several to many, +- 5 mm, narrow, margins glandular. Flower: hypanthium urn-shaped, bractlets 0; sepals small, margins entire to finely toothed, generally glandular; petals white; stamens +- 10 or 20; ovary inferior, styles 1--5, free. Fruit: pome, drupe-like, red to black, generally lighter in color before fully mature, core of 1--5 laterally pitted stones [or not]; sepals reflexed [or not]. "Crataegus douglasii is a deciduous Tree growing to 9 m (29ft 6in). It is hardy to zone (UK) 5 and is not frost tender. It is in flower in May, and the seeds ripen in September. The flowers are hermaphrodite (have both male and female organs) and are pollinated by Midges. Suitable for: light (sandy), medium (loamy) and heavy (clay) soils and can grow in heavy clay soil. Suitable pH: acid, neutral and basic (alkaline) soils and can grow in very alkaline soils. It can grow in semi-shade (light woodland) or no shade. It prefers moist or wet soil and can tolerate drought. The plant can tolerates strong winds but not maritime exposure. Habitat / Range Moist to mesic, open rocky slopes, bluffs, streambanks, lakeshores, gullies, thickets, edges of forests in the lowland to montane zones; frequent in S BC north to 56o N; N to S AK, E to ON and S to SD, WY and CA. [IFBC-E-flora] Open woods, banks of mountain streams and on rocky banks[43, 82]. Western N. America - British Columbia to Michigan, south to California. Thorns: "The thorns have been used as a treatment for arthritis.The point of the thorn was used to pierce an area affected by arthritic pain. The other end of the thorn was ignited and burned down to the point buried into the skin. This treatment was very painful but it was said that after a scab had formed and disappeared, the arthritic pain had also disappeared. 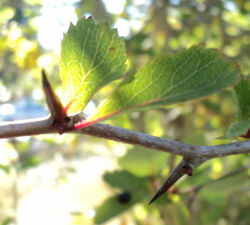 The thorns have been used as probes for boils and ulcers." [PFAF]. "Common hawthorn is an introduced invasive shrub or small tree that originates in Europe, west Asia and North Africa (Phipps 1998). It was introduced as a garden plant in North America and is now present in western and eastern regions of the continent (USA: AK, AR, CA, CT, DC, DE, IL, KY, MA, ME, MI, MT, NH, NJ, NY, OH, OR, PA, RI, TN, UT, VA, VT, WA, WI, WV, CAN: BC, NB, NS, ON, PE, QC) (USDA 2010). 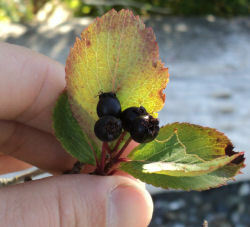 In BC, common hawthorn is found on southeastern Vancouver Island and the southwestern corner of the mainland, with a few reports from the north coast and the Queen Charlotte Islands. 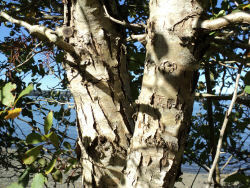 It is frequently encountered in the Fraser delta and is invasive in Garry oak ecosystems on Vancouver Island where it can replace open sites with a dense shrub layer (GOERT 2002). It is locally common at Salmon Arm and Castlegar with sporadic occurrences elsewhere inland (Phipps 1998). "Crataegus monogyna is a deciduous Shrub growing to 6 m (19ft) by 6 m (19ft) at a medium rate. It is hardy to zone (UK) 5 and is not frost tender. It is in flower from May to June, and the seeds ripen from Sep to November. The flowers are hermaphrodite (have both male and female organs) and are pollinated by Midges. It is noted for attracting wildlife. Suitable for: light (sandy), medium (loamy) and heavy (clay) soils and can grow in heavy clay and nutritionally poor soils. Suitable pH: acid, neutral and basic (alkaline) soils and can grow in very acid and very alkaline soils. It can grow in semi-shade (light woodland) or no shade. It prefers moist or wet soil and can tolerate drought. The plant can tolerate maritime exposure. Habitat / Range Moist to mesic disturbed places, thickets, forest margins and open forests in the lowland zone; infrequent in SW BC, rare inland and north along the coast; introduced from Europe. 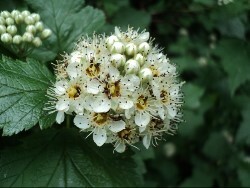 [IFBC-E-flora] Woods, hedges, thickets etc, on most soils except wet peat and poor acid sands[9, 17]. Europe, including Britain, absent from Iceland, south and west the Mediterranean and Afghanistan. 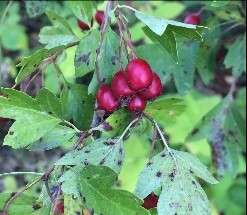 [Jepson] James B. Phipps 2012, Crataegus, in Jepson Flora Project (eds.) Jepson eFlora, http://ucjeps.berkeley.edu/eflora/eflora_display.php?tid=11225, accessed on January 29, 2019.